If you had to, you could live on almost nothing but potatoes. That’s made them one of the most important crops in human history. Entire civilizations would not have existed without them. And you can grow this powerful food crop in a 5 gallon bucket. There’s a trick to growing high potato yields. As the potatoes grow, continue piling soil onto the plants. This forces the plants to supercharge their root growth to keep up. Those roots are what we call potatoes. Now you know why potatoes are grown in hills. 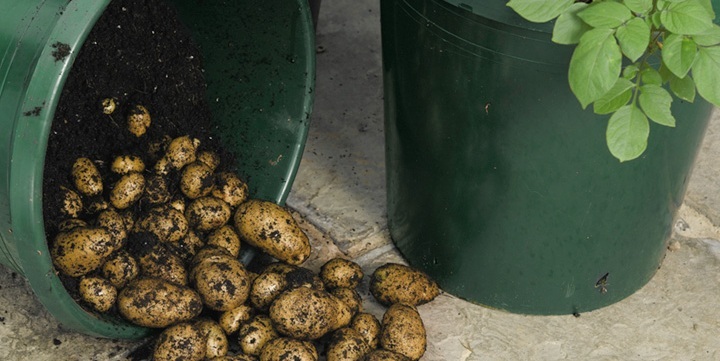 When growing potatoes in buckets, start with a couple inches of growing medium (compost works great) and build up the soil level as the season progresses. Experienced bucket wrangler Mike from GYH explains how he has successfully grown potatoes in buckets for years. While water is of utmost important in growing plants, properly draining excess water away is a close second. Alternatively, you can fill the bottom few inches of your bucket with gravel. This is the same principle that indoor hanging baskets use to supply drainage. You just have to take care not to water your plant so heavily that the water level inside the bucket reaches your soil layer. According to folks who have calculated yield for potato buckets, you can expect about an average yield of 1.5 pounds of potatoes per bucket. I like to compare this number with the amount of potatoes you need to survive for a year. You can survive on potatoes alone, remember? It takes about 6 pounds of potatoes to equal that magic 2000 calories a day you need to be healthy. So you will need about one bucket’s crop of potatoes for each meal. That means that if you’re growing potatoes for survival, you really need to accomplish a much higher yield, or grow your spuds right in the ground. 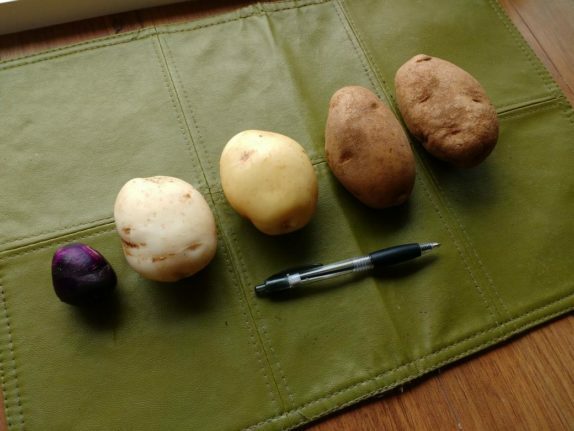 A few different varieties of potato: A Russian blue, a white potato, a Yukon gold and two russets. If you’re growing potatoes, don’t bother with a bland old russet or other boring variety from the store. Grow rare breeds. My favorite rare breeds are the purple potatoes. A New Zealand agricultural study found that red and purple potatoes contain two to three times more antioxidants than plain white potatoes. If you eat as many potatoes as I do, the extra antioxidants are enough to noticeably increase your vigor. You can’t just plant potatoes you buy in the store, because they are treated with chemicals such as Budnip that specifically inhibit potato shoot growth. It’s futile to bury potatoes that won’t grow into plants. Last year I grew Russian Blue, but I have heard very good things about Purple Peruvian so I’m growing that variety this year. Under the right conditions, a potato can remain alive for quite some time without any attention. A potato stores starch and water, which provide it with the nutrients it needs. When you harvest your potatoes and plan to grow new ones in the next season, all you have to do is store them in a dark cool place. The potato will start to grow roots, as you can see in the image. You can simply stick these potatoes in the soil when the temperature is right and grow new potatoes with them. Also see our detailed tutorial on growing sweet potatoes in buckets or watch our Gardening with 5 Gallon Buckets video for growing many other plant varieties. Good advice! Maybe in hot weather you need a lot more “ventilation” holes. Have you heard of the grow bag? You can grow potatoes in a bucket in Texas, but you need to start really early and give them time to be done in the spring so that they don’t have to do a lot of growing in the summer heat. Is it too late to grow them now? I live in San Antonio and I really want to grow potatoes. If it’s too late to grow them outdoors, can I grow them indoors with artificial light or by a window? Question: Should holes be punched in the bottom of the buckets used for growing the potatoes or growing anything? Comment above states he ended up with a bucket of mush. Thanks. Yes! 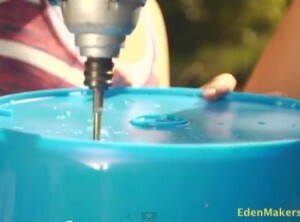 Always make sure to drill drainage holes in any bucket you are using for growing plants. how many no of holes to be done for proper drainage ??? I put holes in botton and on sides at gravel line. so if water (rain) floods bucket it can drain off. NC weather is crazy.. The dirt needs to be loose too. I did this this for the first time this yr. I got 5 little potatoes out of one bucket (about the size of a nickle) just the other day. The tops had died off so I don’t know what happened. I still have one bucket to go that hasn’t quite died back yet. Very disappointed. Prolly won’t mess with growing them this way next yr. Thank you for sharing this. I was talking to a farmer a month ago and saw she was growing potato in buckets. It was the coolest thing I had ever seen – especially for city living. We setup 5 buckets with potatoes feeding them only organic compost and waiting for our spuds to grow. – Thank you for sharing! you can carefully dig down into your buckets and find potatoes. be careful not to puncture or you will have to pick that potato. do not detach them from the main root vines. you can then cover them back up with soil and keep them growing if they are too small for you. as long as the plant is still alive you can “steal” potatoes from it whenever you need to. I don’t know when you are supposed to harvest the potatoes. I waited until they’d finished flowering but the potatoes were small and only a few after months of watering and watching… appreciate your comment. Potatoes are done growing when the leaves on the plant dwindle, typically when the days get shorter and the amount of direct daily light is less than half the day is long (has daylight). This is generally true for most deciduous flora. Regarding their size, I would ask about what you fed the plant. Plants need three main things – N, P & K. When looking at fertilizers in the store, they will all have a rating for their NPK output in a three number array. A very common pellet fertilizer is 10-10-10 and is considered a good all around slow release food for plants. More specific fertilizers like dried blood (15-0-0) and bone meal (3-15-0) can be used in more precise ways. (N) Nitrogen is for the greens above ground (I give my broccoli and spinach extra dried blood to greatly boost output. ), (P) Phosphorous is for the roots (this is the one for potatoes) and (K) Potassium, which feeds the guts of the plant that moves water and nutrients around and the immune system. 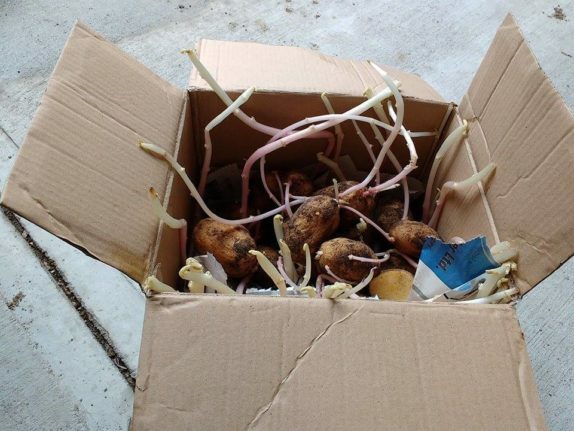 I have had really good luck feeding my potato plants extra bone meal each year and you get some really fat tubers when doing so. Just be careful to not over feed as you can scorch the plant. Which conceptually dovetails into concerns for PH. If the acidity of the plant is too high or low for the potato, it will be unable to absorb any nutrients at all. Bone meal, if used moderately should not change the soil ph too much, but could cause havoc if you dumped a huge pile directly on the greens of the plant. To be organic, you can use chicken and earthworm dung as a general fertilizer, as both are highly nutrient rich, and have a very low impact on PH. Can you just dig a deep hole and fill in as they grow? I’m thinking it woukd take up the same amount of room. Should work but I think a “potato tower” is a more popular option. Might be a moisture thing – maybe not enough drainage with the trench method. Depends on your climate though. In the Video – He states 4 to a Bucket. – Since you posted back in April, I imagine you figured it out by now. I’m going to try this tommorrow as the ones I planted didn’t emerge, So this idea intrigues me. I suppose that dnepeds on where you live. You could buy some better established plants and you could get a decent amount of tomatoes, peppers or cucumbers. I am growing all of these upside down in pots right now. Potatoes are a good bet. Do a search of potato and tire garden. It is where you plant in one tire. As it grows, you add another tire and dirt. I have 6 buckets growing now that are almost 2′ over the top of the bucket. They are starting to grow flowers now. Used the method you explained in the video. When do I flip them over and get the potatoes? I did this for the first time this year. Followed the steps and just emptied my first bucket today. Guess I mixed Michigan whites with redskins, it happens. Anyhow I have two large reds and sixteen good sized whites. Our season here has been hot and humid without a lot of rain until two days ago. Watered them everyday and they have done better than In ground planting. Last year I did them in bags, wasn’t bad but not as good as this. Nice thing is I can sterilize the buckets and reuse them next year. No rotating in ground plants. Made sure that I drilled enough holes sides and bottom for drainage. Also made sure they got an inch of water daily. Grown on a deck. Glad I found this, and now it is time for some fresh potato salad. Purple potatoes sound exotic. I think I will try those. I wander if the purple potatoes are the same as blue potatoes? Pingback: Growing Potatoes Part I – Two Great Ways to Grow Potatoes | How Much Wheat Am I Really Going To Eat?